President Emmerson Mnangagwa, who first swept to power through a popular military coup in November 2017 - yesterday vowed to bring to book rogue members of Zimbabwe's gung-ho military who left a trail of blood around the country during last week's fuel protests. Analysts who spoke to the Daily News about this unexpected move immediately welcomed the announcement, saying this would go a long way in healing the nation and calming down rising political tensions in the country - if the president carried through his promise. At the same time, Mnangagwa also moved to invite opposition leader Nelson Chamisa and other key stakeholders in the country for a national dialogue yesterday - in the wake of last week's mayhem, and in a desperate bid to address Zimbabwe's worsening political and economic crisis. The under-pressure 76-year-old Zanu-PF leader announced these bold moves soon after he returned to the country late on Monday evening, after he cancelled his scheduled trip to Switzerland where he was due to attend this year's meeting of the World Economic Forum (Wef) - which kicked-off yesterday. 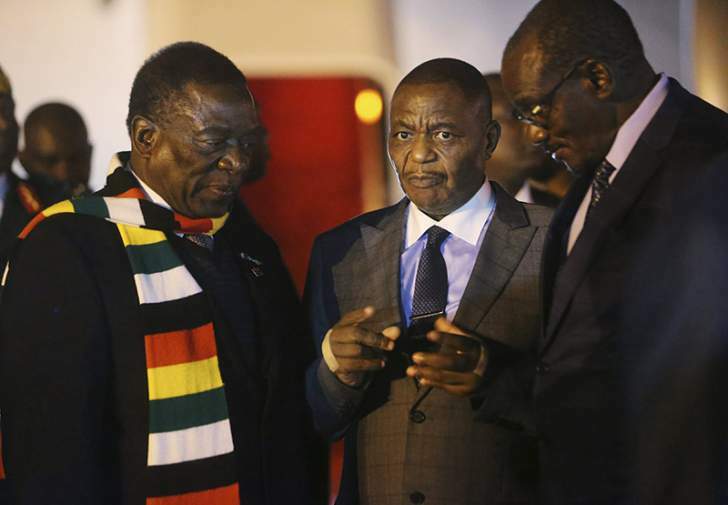 Mnangagwa's abandonment of the Davos jamboree also coincided with the public explosion of fresh ructions within his ruling Zanu-PF, amid worrying claims that there was a plot to topple him from power by some of his disaffected lieutenants. Writing on Twitter yesterday, Mnangagwa said he would leave no stone unturned in dealing "decisively" with rogue members of the security forces found to have taken part in human rights abuses and the deaths of an estimated 12 civilians during last week's chaos. Last week, police and soldiers were engaged in running battles with protesters who flooded the streets of Harare, Bulawayo and other towns - to protest the steep fuel price hikes which were announced by the president ahead of his tour of Eastern Europe. hapless citizens comes as there is growing criticism of his government inside Zimbabwe and internationally. Among those who have launched a scathing attack on him and his government is South Africa's major opposition party, the Democratic Alliance (DA), which is also putting pressure on President Cyril Ramaphosa to act on the rights abuses by the local security forces. The party has also warned ominously that should Ramaphosa fail to intervene decisively in the matter, the DA would soon call upon the International Criminal Court (ICC) to investigate Mnangagwa's government. Mnangagwa's surprise decision to hike the prices of both petrol and diesel from $1,32 and $1,24 to $3,31 and $3,11 respectively was at the heart of last week's protests and the ensuing mayhem. His move yesterday to reach out to Chamisa came as calls for national dialogue aimed at mitigating Zimbabwe's myriad crises have reached a crescendo, following last week's ugly disturbances, as well as the subsequent government crackdown against opposition officials and pro-democracy groups. "The government of the day has created this crisis. They should not point fingers at the opposition because it is not the one that hiked prices … and it is not responsible for the violence that has erupted. "We encourage the government to climb down their high horse and admit that we are in a dire situation that requires national dialogue. It is a situation that cannot be solved by one party but needs everyone to be involved," Magaya said. On its part, the Zimbabwe Human Rights Commission (ZHRC) also said it was time for Mnangagwa to engage the opposition and other key stakeholders to end the country's deepening crisis. "The Zimbabwe Human Rights Commission … calls upon government to take the lead in convening a platform for national dialogue with partners in all sectors, including captains of industry, labour unions, independent commissions, civil society, the opposition and ordinary citizens in order to find lasting solutions to the prevailing economic challenges, to ensure respect and observance of human rights and promote peace and security in the country," the ZHRC said. The Elders - the respected international group of former leaders who use their collective experiences to promote peace in the world - also said at the weekend that it was important that Mnangagwa embarks on inclusive dialogue to resolve Zimbabwe's deepening crisis. "The Elders reiterate … their belief that an inclusive national dialogue is the best way to defuse tensions and ease the political and social polarisation the country has seen since … Mugabe was removed from office in November 2017," the group said. Before the chaos, Chamisa, writing on social media, had reiterated his desire for dialogue with Mnangagwa - whom he referred to as "my brother", in a welcome move which signalled his abandonment of his once militant approach to talks. "I have met with many on our worsening situation and unbearable suffering. The back-to-school burden, high prices, non-performing economy, joblessness and worthless salaries bring sorrow. "On this, I call upon my bro(ther) ED to urgent dialogue to solve our politics and economics or it gets worse," he said on Twitter.